During our fifth day in Hong Kong, my friend and I visited the famous giant Tian Tan Buddha (also known as Big Buddha) at Po Lin Monastery in Ngong Ping, Lantau Island. After our yummy breakfast at Kam Wah Cafe in Mongkok, we took the MTR (Mass Transit Railway) to Tung Chung Station, which is the last stop on the Tung Chung line. 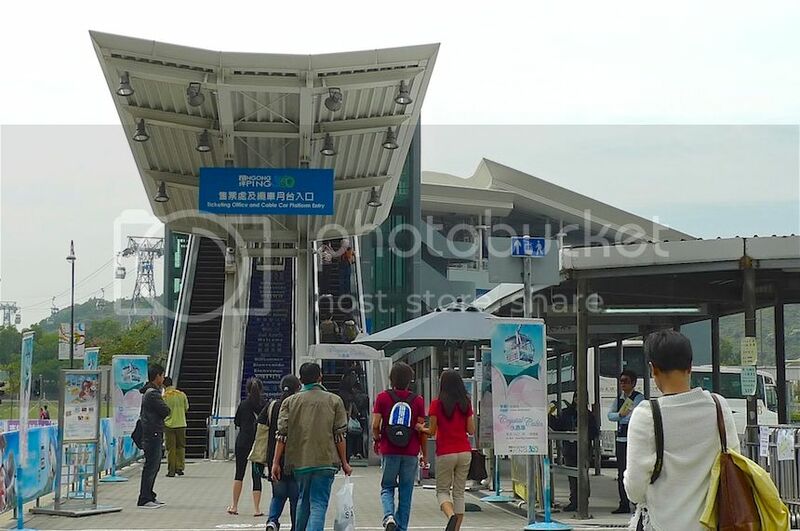 As we were departing from Mongkok, we needed to switch to the Tung Chung line at the Lai King MTR Interchange Station. Refer to the MTR map HERE. 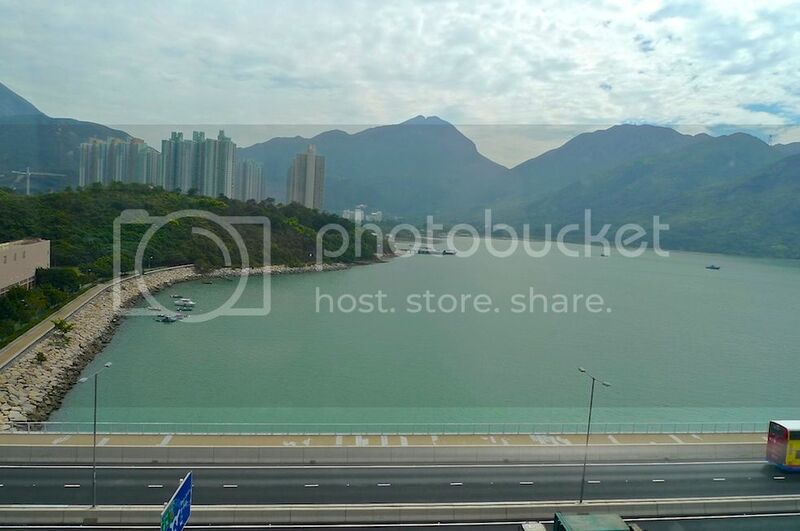 By the way, the Tung Chung Station is just one station away from Sunny Bay Station which leads to Hong Kong Disneyland and 2 stations away from Tsing Yi Interchange Station that leads to Hong Kong International Airport. Alighting from the Tung Chung MTR Station via Exit B, we were greeted with the Citygate Outlets which is a discount shoppers' paradise. Citygate Outlets offers year-round discounts ranging from 30% - 70% on all merchandise, which are mainly off-season branded goods, so if you are planning to shop in Hong Kong, make sure you shop here! I did not mind the goods being off-season because whatever that is 'off-season' in Hong Kong is still considered 'new arrival' in Malaysia. Haha! 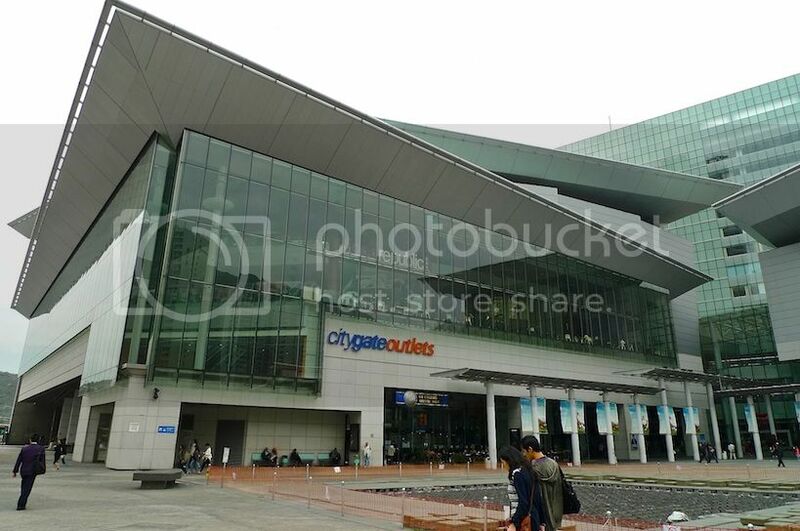 As we were planning to go to Tian Tan Buddha, we did not step into Citygate Outlets that morning. Luckily, we managed to do some shopping here on our return journey later in the evening. 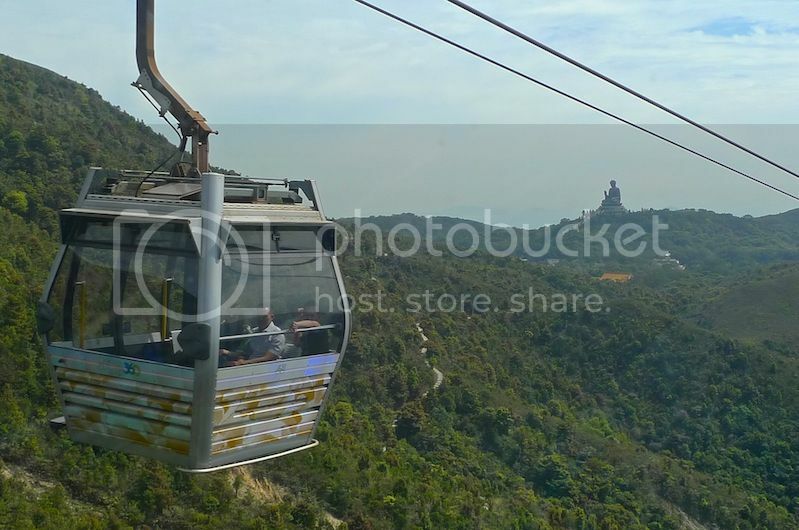 There are 2 modes of transportation from Tung Chung to Tian Tan Buddha. You can either take the bus or the cable car. The bus station is just next to the Citygate Outlets. Of course the bus is much cheaper but it takes a longer time to reach there, about 45 minutes to an hour. In contrast, the cable car ride takes only 25 minutes. My friend and I decided on the best of both worlds. We opted for the cable car on our journey there and the bus on our return journey. I could not remember the exact fare for the bus and the cable car but we paid HK$98 (US$12.60 / RM41.70) each for this combination. 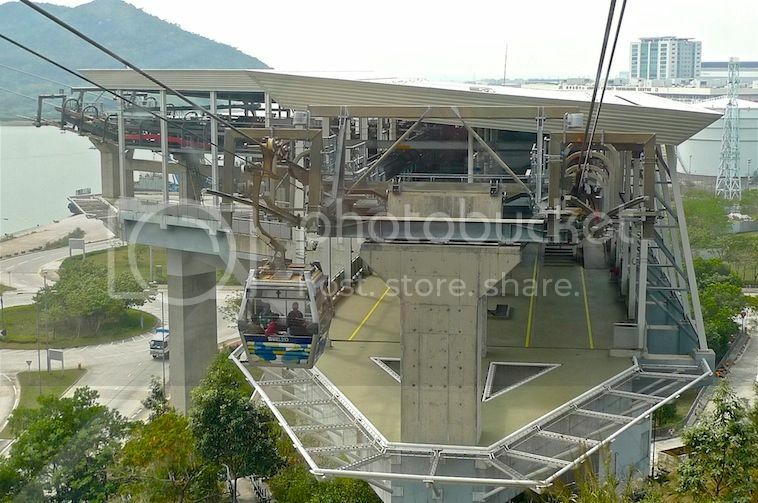 There are 2 different kinds of cable car to choose from - the Standard Cabin and the Crystal Cabin. The difference is that the Crystal Cabin is equipped with a glass bottom, meaning you are standing on a transparent glass floor! As someone with a fear of heights, I must be crazy to choose the Crystal Cabin which was of course, more expensive than the Standard Cabin. But I guess I just needed to experience it and face my fear! There's actually a third and more expensive option which is Private Cabin, whereby you are given priority boarding and queue-free ticketing, but I think that's really quite unnecessary. We did not really have to queue that long for our cable car anyway. 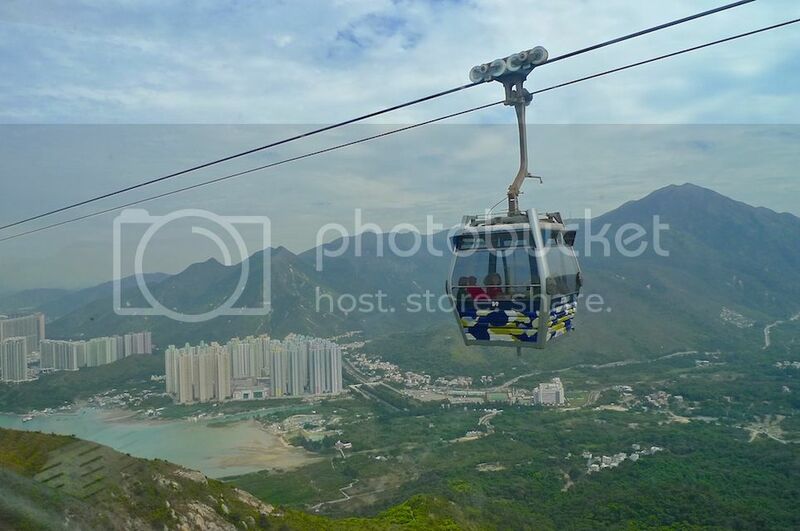 This is my second cable car ride during my 6-day Hong Kong trip. The first was at Ocean Park. Read about it HERE. 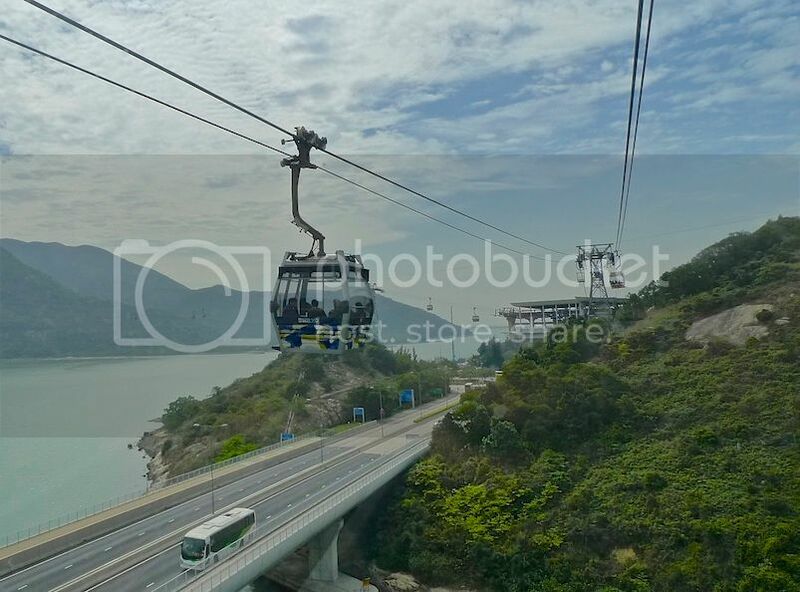 Compared to the 15 minutes cable car ride from The Waterfront to The Summit at Ocean Park, this 25 minutes Ngong Ping cable car ride was more impressive and breathtaking. Rumors about one of the cable cars falling off the ropeway during an extreme testing in 2007 made me a little nervous but I tried to focus on the beautiful view around me. 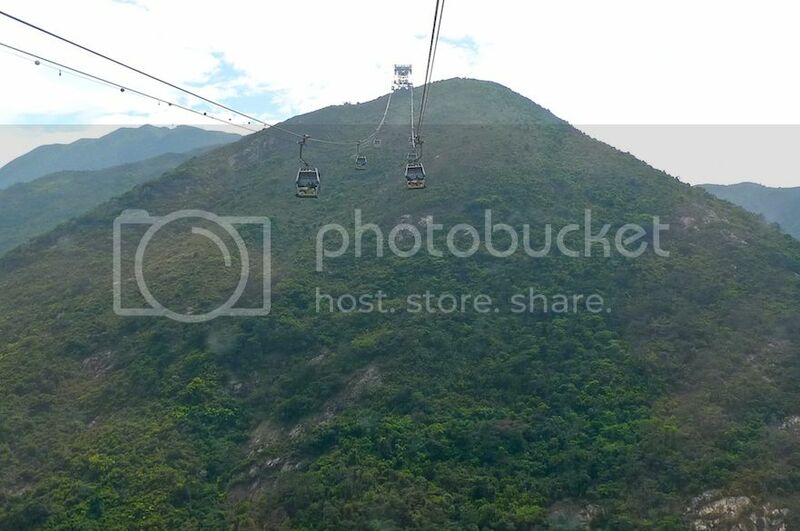 If it's any consolation, I heard that since the MTR Corporation (which manages the MTR system) took over the running of this cable car, no major incident had been reported. For added safety, the cable car stops operating during strong winds so be prepared to take the bus or postpone the trip if it's an extremely windy day! The 360 degree views around me was stunning. 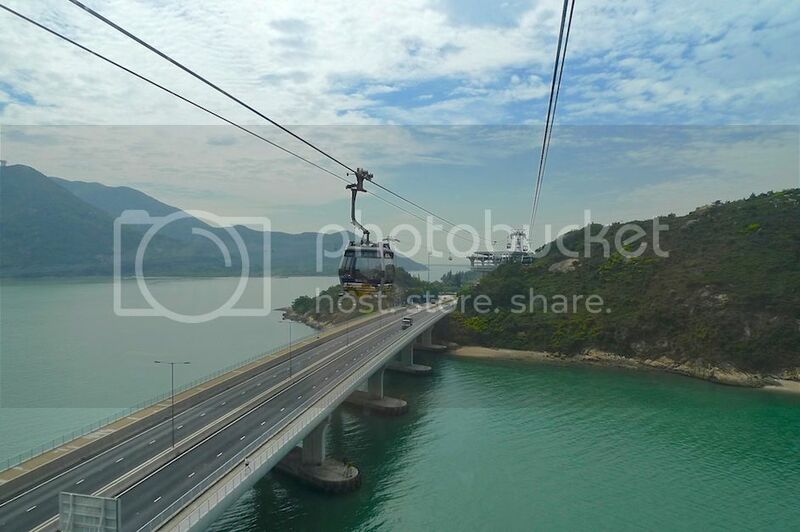 No wonder they called this cable car project the Ngong Ping 360 - a tourism project that involves not only the cable car but also the Ngong Ping village near the Tian Tan Buddha. 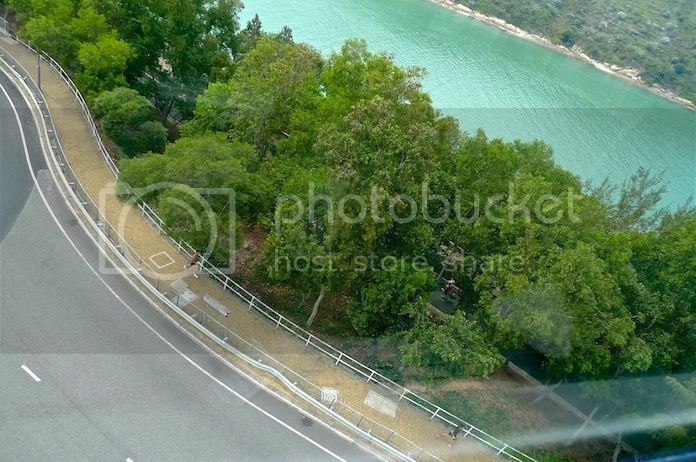 Check out the map of the Ngong Ping 360 system HERE. I have totally no regrets choosing this cable car ride. 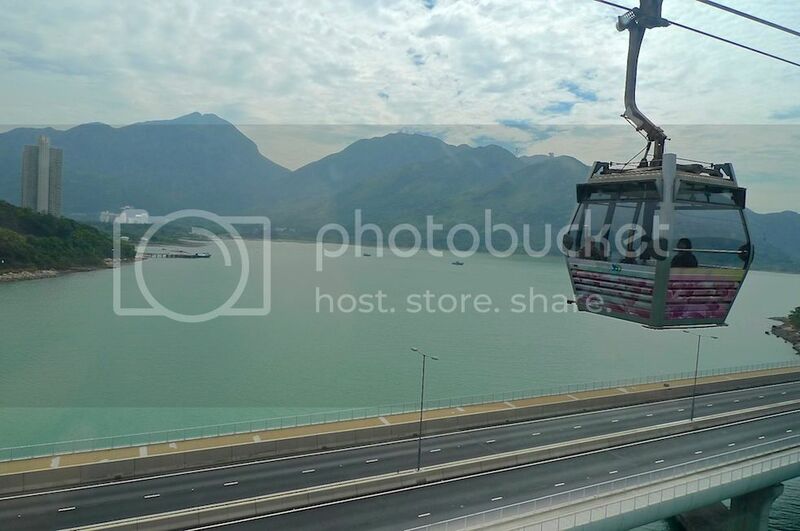 Just look at the amazing view of Tung Chung Bay! Awesome! 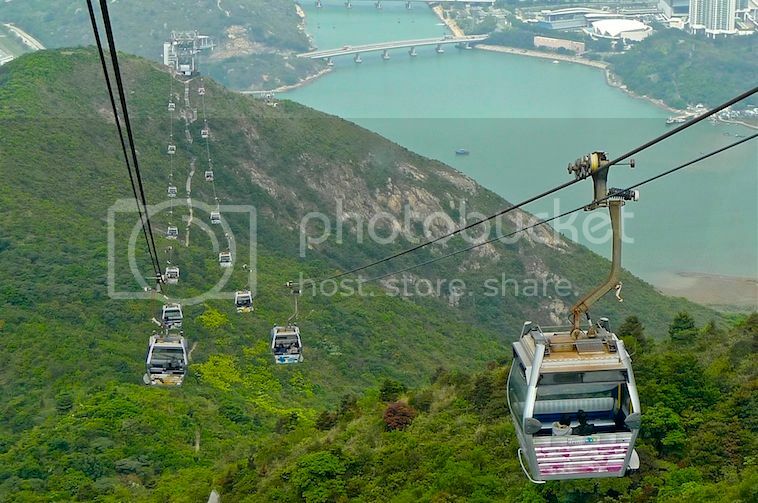 The Ngong Ping cable car is actually a 5.7 km long bi-cable gondola lift system. 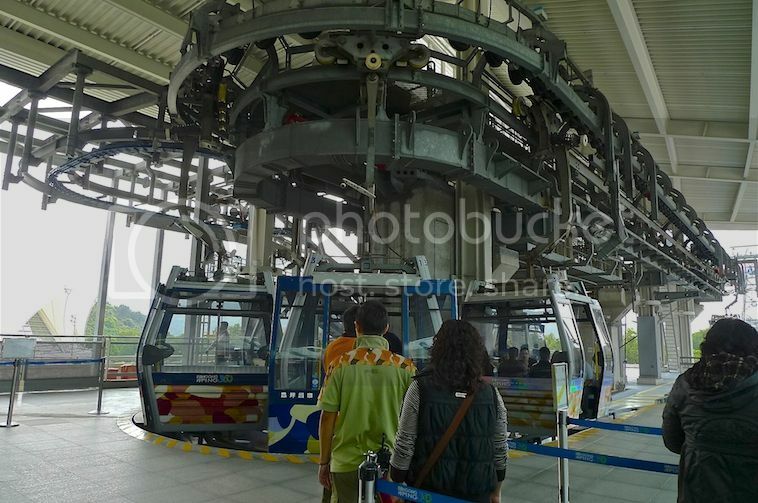 Quite similar to the cable car system in Genting Highlands although the one at Genting is only 3.38 km long. Do you know what's the difference between a cable car and a gondola? I have no idea, but they call this a cable car anyway. 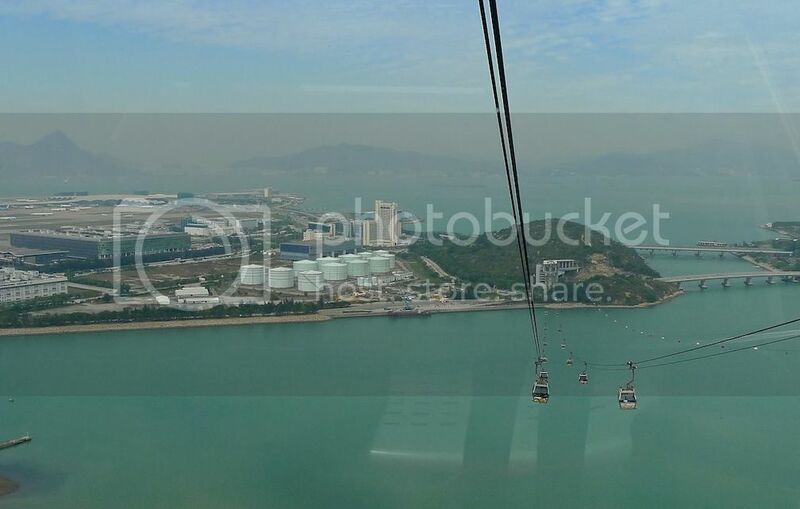 The weather was just perfect to take photos from inside the cable car. Although the reflections from the glass windows were a bit of a hindrance. We soon reached an angle station at Airport Island. Yes, this is the area near the Hong Kong International Airport. Why angle station? That's because at this station, the cableway makes a 60 degree angle turn! 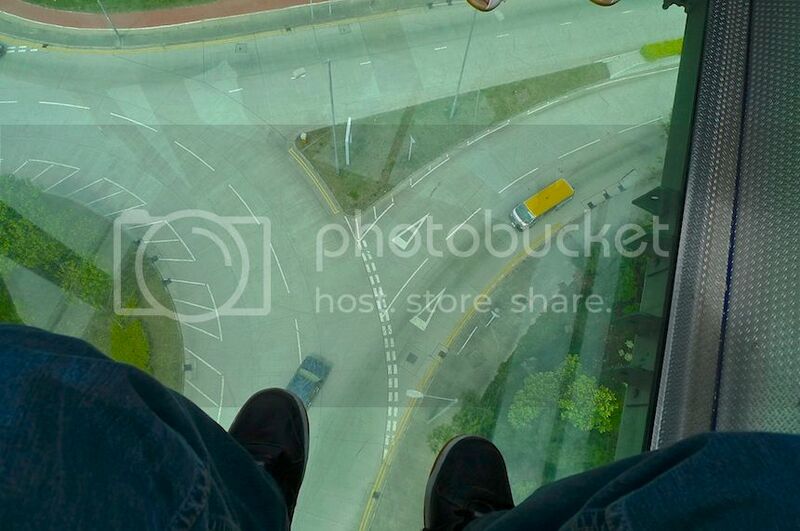 Surprisingly, the transparent glass floor of the Crystal Cabin did not seem too frightening for me. Well, I did not purposely try and jump to see if the force of my weight would break the glass, but I was pretty calm. LOL. 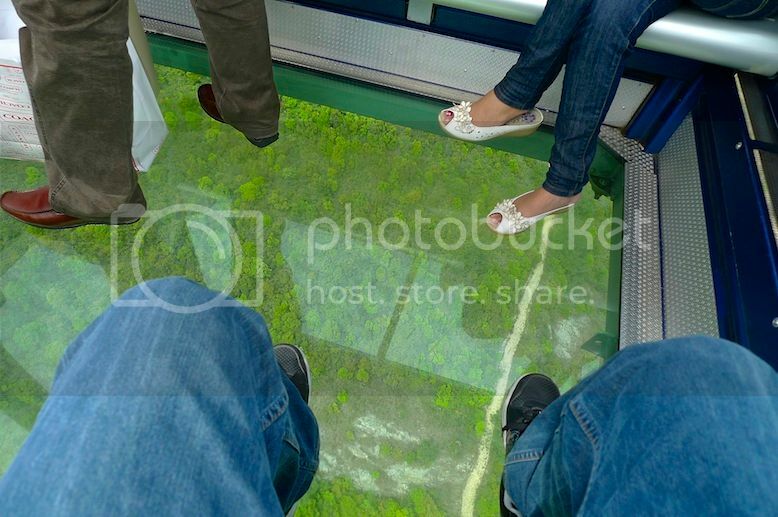 I thought the glass bottom was a great way to see uncluttered bird's eye view of the ground below. This is the view ahead of us as we moved away from the angle station at the Airport Island. 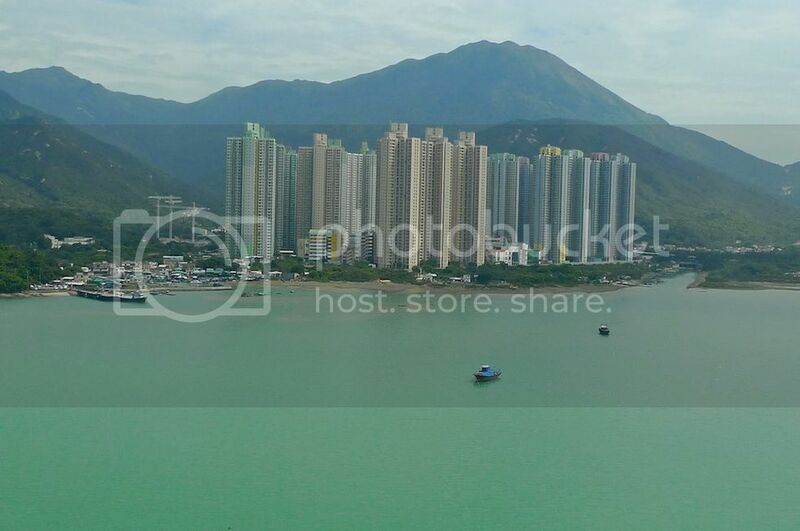 The vast scenery of the South China Seas and the high rise buildings were fantastic sights to behold! 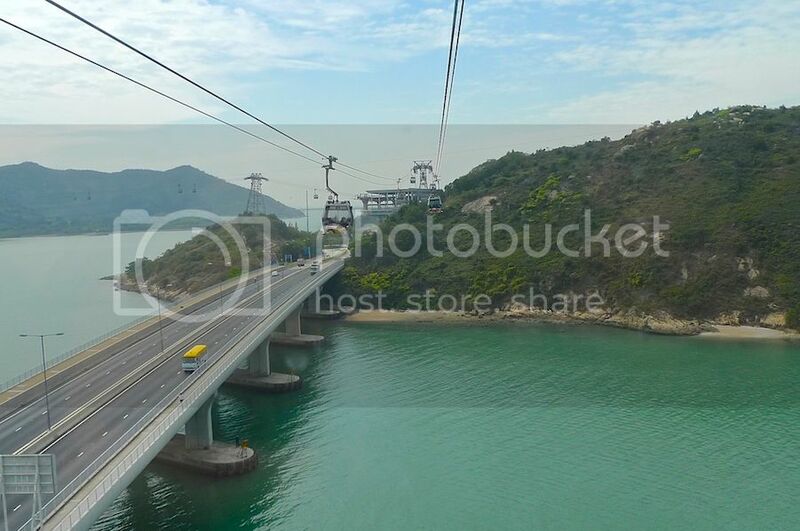 One of the many cable cars that passed us going the opposite direction towards Tung Chung. 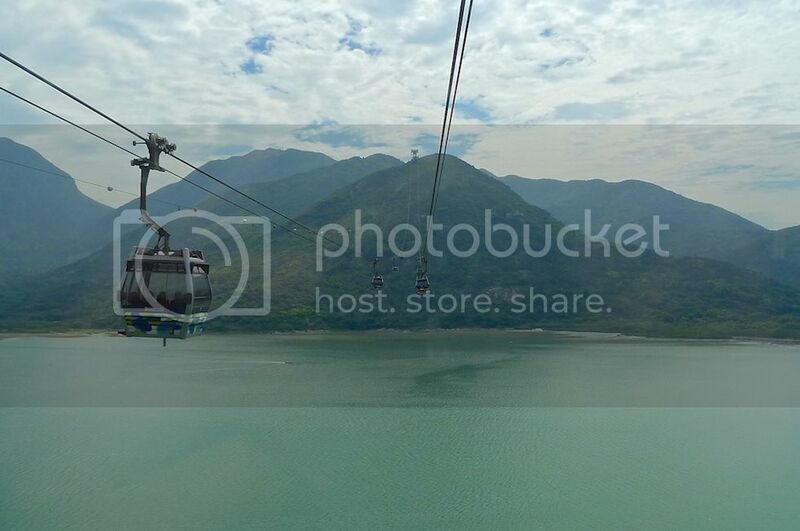 Ahead of us was the green mountainous terrain landscape of Lantau Island. Beautiful! That's the Hong Kong International Airport on the left of the angle station which we left behind. I guess the planes were too tiny to be seen in this photo? 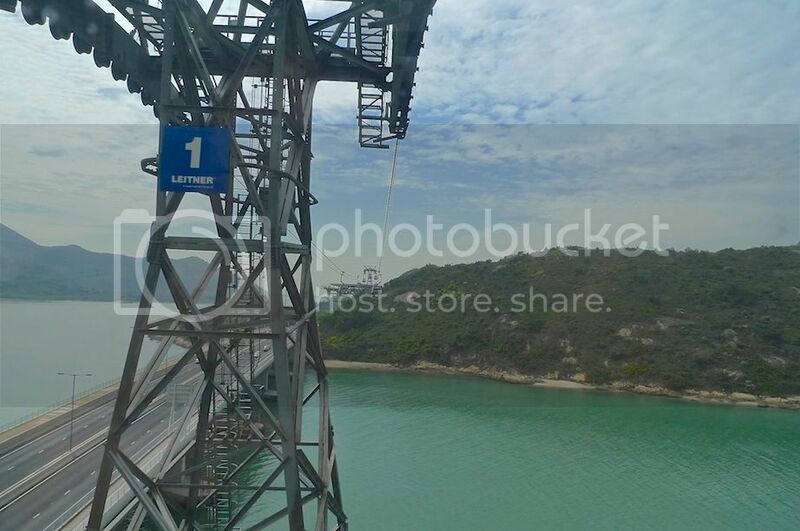 Can you see the 60 degree angle turn of the cableway? 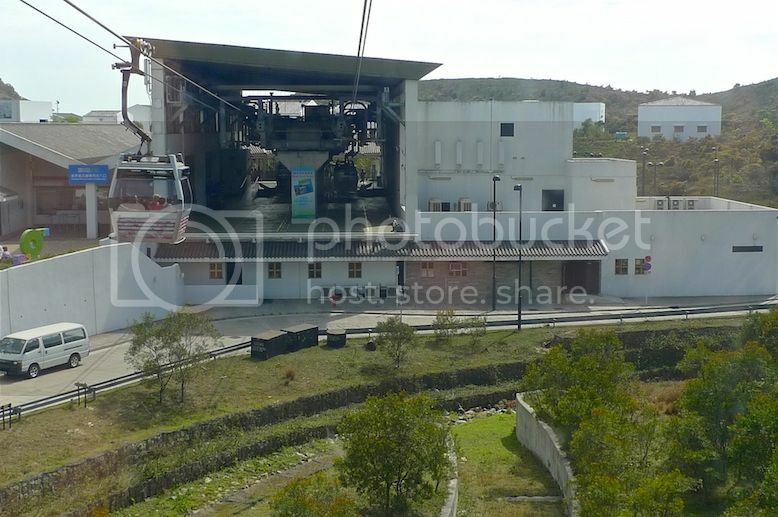 If not mistaken, I think there were altogether 2 angle stations and 8 towers supporting this cable car system. That's one of the towers in the photo below. 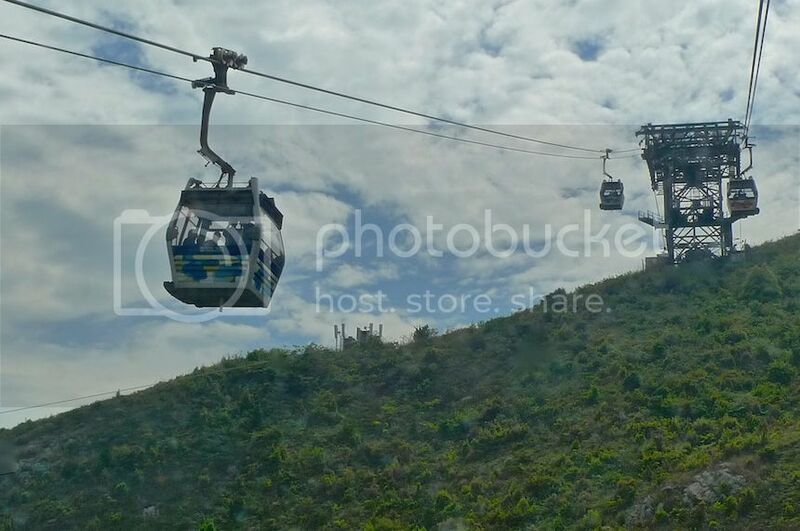 Each cable car can carry up to 17 people with a seating for 10. During our trip, there were only 4 people (including my friend and I) in our Crystal Cabin. I was glad I could move around freely to take photos. This is one reason why you should never visit Hong Kong during the peak periods. 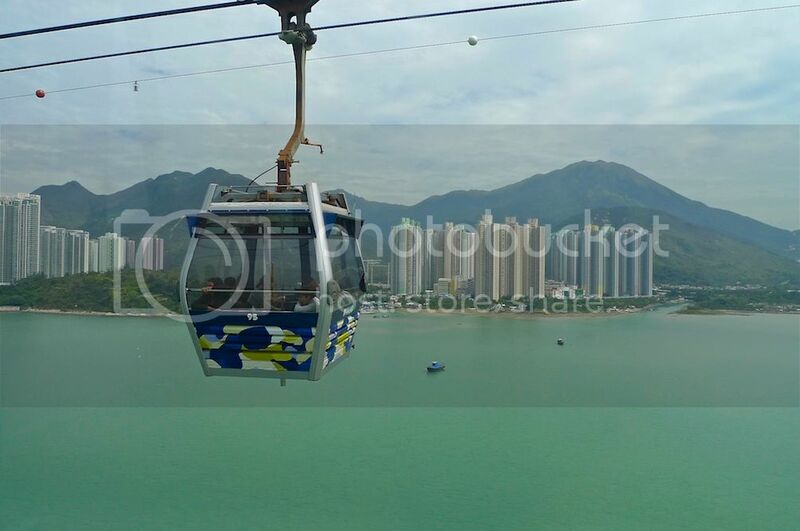 Imagine sitting in a crammed cable car, unable to take photos of the surrounding 360 degree view! 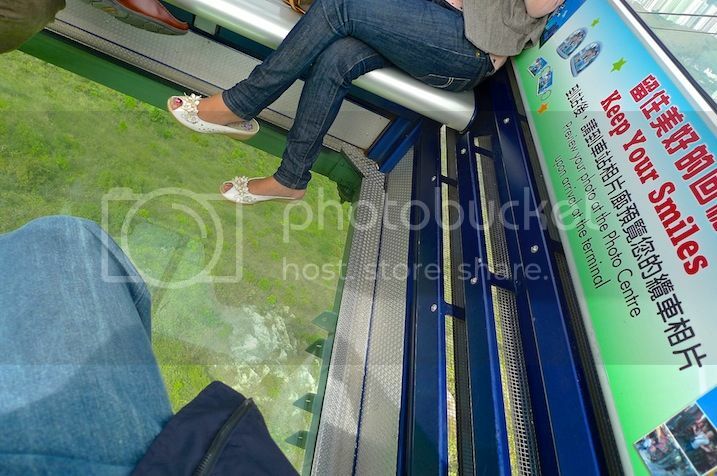 Besides, a crammed cable car with glass bottoms sound a bit risky and scary to me. LOL! I remember we also went through another angle station although I did not take any photos of it. I would say the best view is from this photo below where you can see the serene South China Sea and the green verdant landscape of the mountains. Soon, the Tian Tan Buddha statue came into view. It is one of the biggest Buddha statues in the world although it seemed tiny from here. 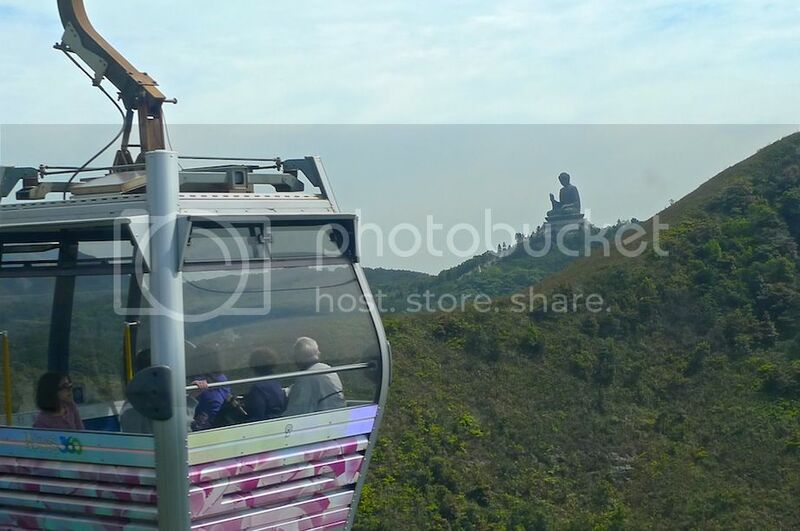 As we got nearer to Ngong Ping Station, the Tian Tan Buddha statue appeared larger. After riding the impressive cable car for about 25 minutes, we reached our destination. I could not wait to visit the Ngong Ping village and the Tian Tan Buddha! 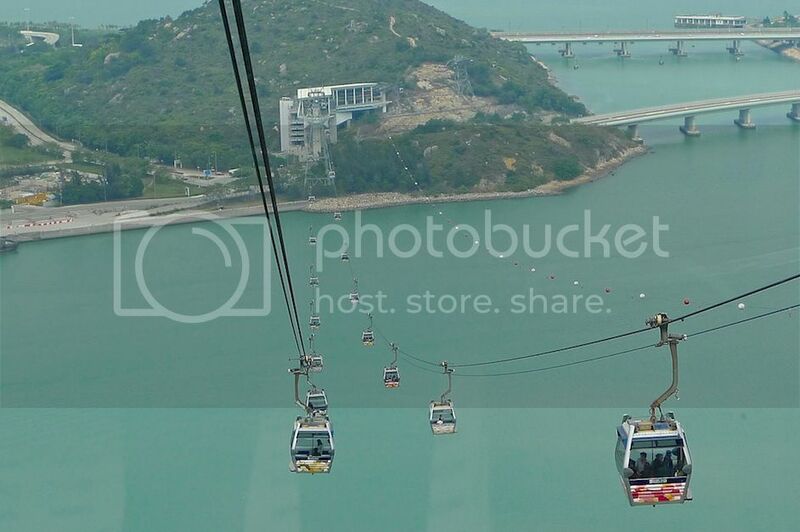 For more information on Ngong Ping 360, visit this official website.